Harvest SA’s readers are forward thinking, solution-driven, profit orientated and politically diverse. Our wide readership is a direct result of the magazine’s broad range of topics and expert contributors. Harvest SA showcases the latest in agricultural research from bodies such as the Agricultural Research Council. 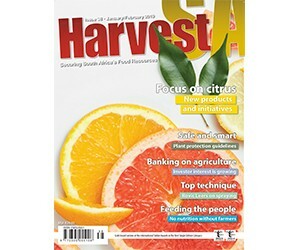 Harvest SA is the perfect multi- award winning agricultural magazine that will give your company the most cost-effective way to reach your target market and get your message across to important stakeholders in the agricultural sector of South Africa. How will Harvest SA make a difference to your business? By offering what both readers and advertisers want - a quality product, realistic advertising rates and most importantly, editorial that is written to be read. Harvest SA is a guaranteed medium for brand building, help you attract top buyers and also has a record of generating direct response for advertisers. Advertisers can choose from a number of advertising packages through which their products and services can be exposed as this publication is the perfect vehicle to feature your company in and get your message across to important stakeholders in the agricultural sector of Southern Africa.